Independent Stampin' Up!® Demonstrator | For all your papercrafting needs, Australia wide. Following on from my post last week, I played around with Jacquie’s Scalloped Tag Topper Punch Box and made a couple of modifications. I wanted the new box to have flaps on the inside, so the box was more ‘closed’ on the sides. 1. Cut card stock to 4 ½” x 7 ¾”. You can comfortably get two boxes from one A4 sheet. 2. Score short side at 1¼ and 3 ¼. 3. Turn and score long side at 1¼, 3 ¼, 4 ½ and 6 ½. 4. Remove two corners and cut along the score lines as shown on the first template above. Hope you can see the pic clearly enough. Let me know if you can’t and I’ll add a better shot. Tip: You can cut the score lines in different ways to create the tabs but this layout worked well for me because it added extra strength to the sides while still looking neat on the inside when the lid was raised. 5. Slide one of the three flaps over the guide of the Scalloped Tag Topper punch, and then push it right inside. Punch the decorative edge. It’s a tight fit, and takes a little wiggling – that’s the technical term – but it does work. Repeat for the other two flaps. 5. Add Tombow adhesive or Sticky Strip to the shaded areas as shown on the second template above. 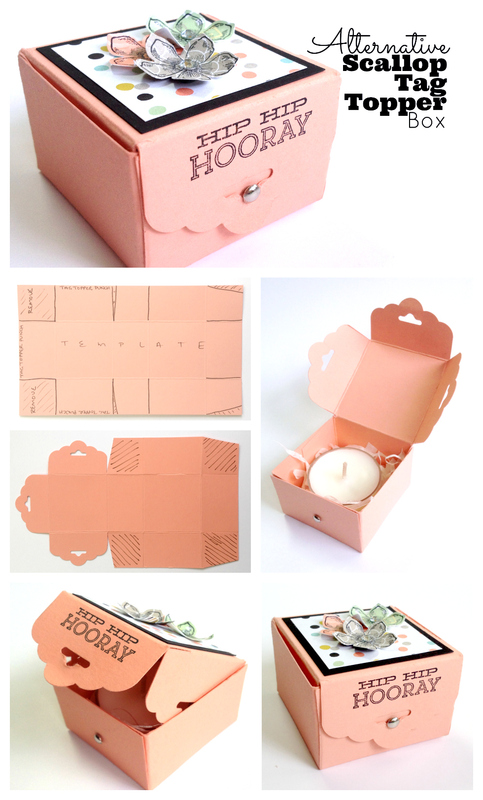 Assemble box. Tip: The two side flaps go IN the box, and the front one goes on the outside. Note: If you want to make the box I shared in last week’s post then follow steps 1 to 3 above, but remove the side flaps. Thanks again Jacquie Bell for the inspiration! Oh, and I know it’s kinda obvious but for the kids out there: don’t light the candle while it’s in the box. LOL. The box is for decoration only. Alrighty, I hope you have lots of fun making these. Don’t forget to leave some comment love and let me know what you think. Today I’m back to share the first of the swaps from our recent team day. 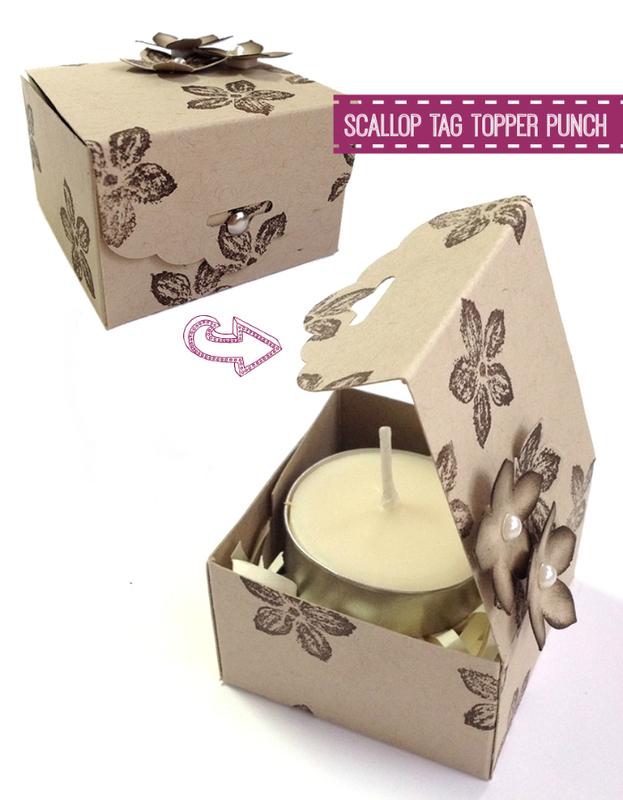 This one is a cute box – suitable for a tea light candle or similar small item – created with the brand new Scallop Tag Topper Punch. This gorgeous creation is a real Wow – and I couldn’t help but add it to the lineup of my March events. It was designed and created by Jacquie Bell (thanks for letting me share it here, Jacquie!). The Crumb Cake cardstock was scored with the Simply Scored board, and the top flap decorated with the Scallop Tag Topper punch. The Scallop Tag Topper Punch created that cute cut-out where the brad holds the lid closed, and is generally used for attaching ribbon. The stamps are from the delightful Petite Petals bundle of matching stamps and punch. All new products in the 40 page seasonal Occasions Catalogue. Hi friends, thanks for visiting. My little creative corner has been crazy busy lately. We had our BIG team day on Saturday, so I was kind of off the grid for a while getting ready. It was a GREAT day! I have loads of photos from the event to share – they’ll be up soon. For today, I have a cute little project to keep you busy on a quiet weekend. 1. Find an old wooden picture frame. Remove glass and paint or whitewash the frame. TIP: Visit Op Shops or garage sales to pick up a cheap frame. I got mine for $1 from the Barwon Heads All Saints op shop while we were camping nearby over the summer. 2. Paint the backing board OR replace it with burlap as I did on the one below. My burlap came from one of the bags we got on last year’s Incentive Trip. You can see it in the third collage on this page, but you can pick up burlap fairly easily these days. I used a staple gun to attach the burlap to the back of the frame. Pull it nice and tight. Check that the staples won’t show through. 3. Use the Springtime Hello Simply Created kit to make an awesome garland! Everything you need is in the kit, and at only AU$15.95 I don’t think there could possibly be a simpler and more inexpensive way of putting together a garland. loads of adhesive-backed, pre-scored printed stickers to create your garland. You can pin photos or other special items along the thread as you wish, and mix up the display whenever you want. I had enough leftover stickers to make up about half a dozen cards. Order your Springtime Hello Simply Created Garland Kit here (delivered to Australian addresses). So tell me, are you into the framed art or framed chalkboard look? Have you made anything like this, or is it still on your To Do list? As promised, I’m back today to share a sweet little desktop calendar project. This is one of the projects we’re making in my January parties and clubs, and they are heaps of fun to make. Practical, too! Got any spare mini calendars lying around? If so, you can whip up one of these in under 10 minutes. You can also print out your own mini calendars – there are many options available online. 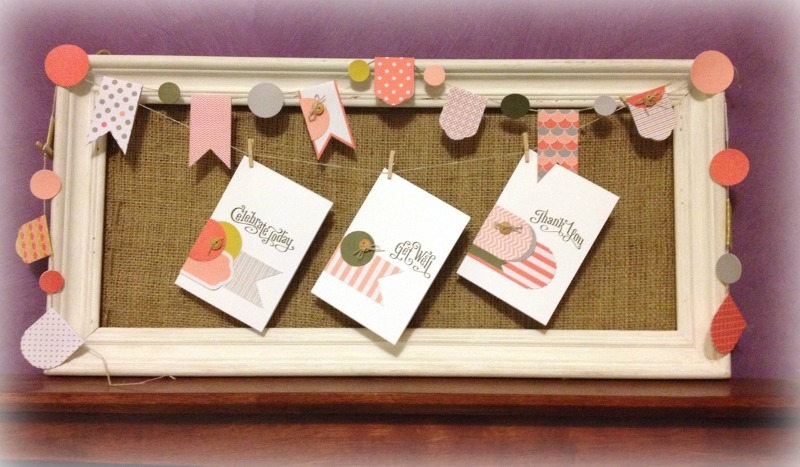 This project uses the card base and envelope from the Sweet Sayings Card & Envelope pack that I shared earlier this week. It even has a pocket at the back for storing all those odds & ends that accumulate on our desks. 😉 Or is it just mine? Ok, so how do we do it? 1. First up, embellish the card front. It’s much easier to do this now, before we turn it into a stand-up calendar. I used Stampin’ Up!’s Bright Blossom stamp set on mine, with flowers punched from the Itty Bitty Punch Pack. I also added a Pool Party mat behind my calendar and attached bakers twine before hanging it from a mini silver brad. 2. Cut white cardstock to 12.7cm (5 inches) x 6 cm. Score at 1cm, 3cm and 5cm, creating a concertina fold. Adhere flaps to the inside front and inside back of the card using Sticky Strip, to create a base. This will prevent the card from ‘walking’ (ie. when the front and back move apart). We don’t want our calendar to collapse on us over time! Adding this base makes the calendar stand up, nice and sturdy. And you can even pop a pen in there! 3. Ok, now for the pocket. Choose one of the envelopes that come in the Sweet Sayings Card & Envelope pack. Now score the remaining three sides at 1cm. Be gentle! Don’t tear the paper. Put your hand inside the envelope and carefully flatten the sides. Add glue dots to secure the bottom corners underneath. Now you can attach the pocket to the back of your calendar! Would you like one of these ready-to-assemble kits? Thanks for stopping by and don’t forget to leave me a comment <3! Today is Fathers Day in Australia! Wishing all the fellas a great day. The kids had a few extra treats to give to their dad so we used one of the Tag A Bag gift boxes and decorated it just like we did in this post. 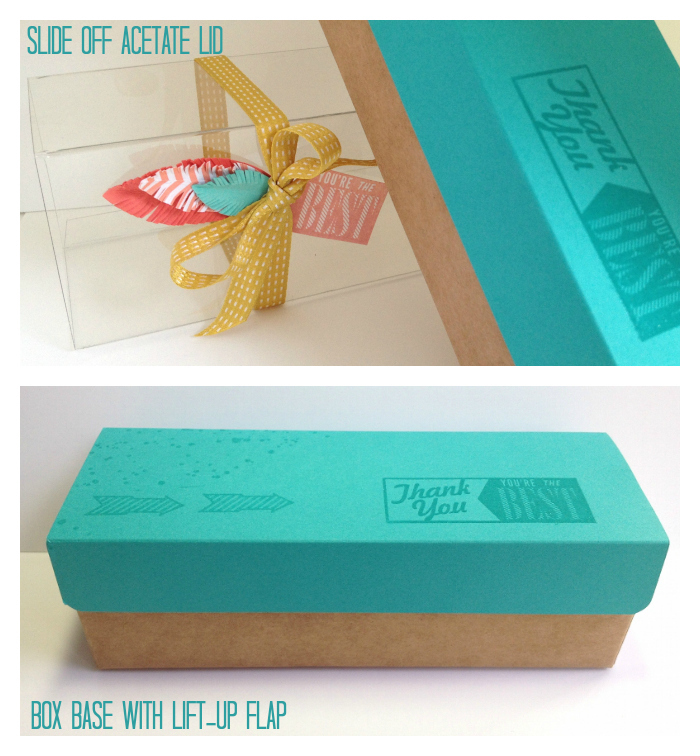 This time we used Stampin’ Up!’s Soho Subway patterned paper to whip up a quick finished treat box in no time at all. Soho Subway is a GREAT set of patterned papers for male themed projects. Soho Subway DSP, double-sided patterned paper. p151 Annual Catalogue (AUD$18.95). Better get back to spoiling hubby, but I just want to give a quick shout out to all the wonderful crafters I met yesterday at Paperific. It was a fun day, and we were kept very busy. Lots of familiar faces and stamping friends dropped by, which kept me smiling all the way home to Creswick that night. This brings craft show season to the end for this year, but we’ll be back next year to share more at the shows in 2014. Tag a Bag Gift Box. Supplies: Gorgeous Grunge stamp set, Hello Lovely stamp set, Bermuda Bay cardstock & ink, Crisp Cantaloupe ink, Summer Starfruit 1cm stitched satin ribbon. Have you noticed the new Tag a Bag Gift Boxes on page 159 of the new catalogue? You get 8 handy boxes PLUS the assembled acetate sleeves in each pack for only AUD$11.95. They are easy to dress up. Or simply tie a ribbon or add a tag and you’re done! This box was one of our Convention Make & Takes. To create the flap, trim Bermuda Bay cardstock to 11cm x 17.5cm, and score it at 2.5cm and 8.5cm. Attach the flap at the back of the box only, so it lifts up like a lid. When it’s closed, the acetate sleeve slides right over the top to keep it shut. CLICK HERE TO ORDER Tag A Bag Gift Boxes online. BONUS: Order online before 10th Sept and get the full tutorial to complete this project FREE! Don’t forget to include this month’s hostess code ZJGKBFFV before checking out, for your chance to win free products. Any questions? Just ask.